Hello! 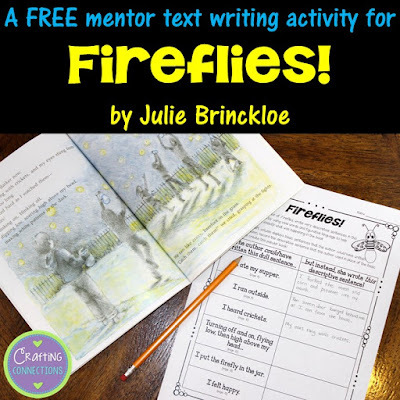 Welcome to our Mentor Text Lesson link-up for summer. Although the overall theme is summer, you can definitely use most of these activities at any time during the year! A list of all of the participating blogs is at the bottom of this blog post. Each blogger will be sharing a mentor text lesson using a particular book. Hop through the various blogs to find some outstanding read-aloud books, and grab the amazing freebies that accompany each book! (Some will be forever freebies, while others will be free for a limited time.) Also, don't forget to enter the Rafflecopter at the bottom of this post for a chance to win TpT gift cards! 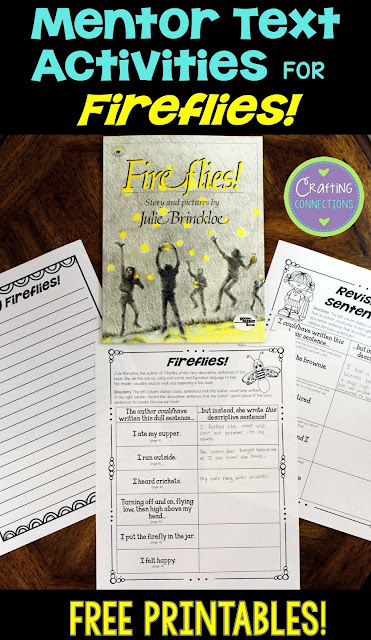 The book I chose to feature is Fireflies by Julie Brinckloe. I fell in love with this book the very first time I read it. I was able to connect with this book immediately, as my personal memories of catching fireflies on late summer nights as I was growing up came flooding into my mind. My big brother, twin sister, and I, along with all of the neighborhood kids, would "dash about, waving our hands in the air like nets, catching two, ten- hundreds of fireflies, thrusting them into jars, waving our hands for more". The author's words capture my own memories perfectly! Her eloquent words describe my memories in a way that I would have difficulty expressing. And that's why I chose to use this book as the basis for a writing minilesson! Fireflies is written from a first-person perspective, and begins with a young boy eating his dinner on a summer evening. When he spots a few flickers of light out the window, he shovels in the rest of his dinner, grabs a jar, and flies outside. His other neighborhood friends have already begun to gather with their own jars. 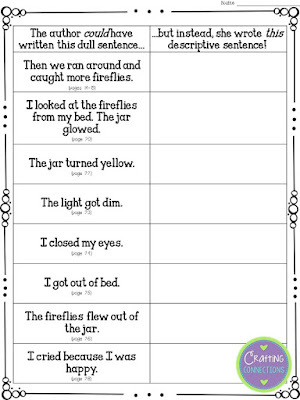 As the sky grows darker, they "run like crazy", "grasping at the lights", and "thrusting their hands into the jar" once they capture a firefly. Eventually, it is time for everyone to return to their houses. Once in bed, the boy begins to feel guilty about his mass of fireflies, growing dimmer by the minute. Eventually, he flings off his covers, goes to his window, and frees his fireflies. The story ends with the words "The moonlight and the fireflies swam in my tears, but I could feel myself smiling." I read this story aloud to my students twice. The first time, we read it for pure enjoyment. The second time, however, we read it with a purpose. Before beginning the second reading, I ask my students if they would have been able to visualize what was happening in the book if there hadn't been any pictures. After agreeing that this definitely would have been possible, we discuss the reason for this: the author used exact and descriptive words that make it possible for the reader to visualize the scenes in the story. Then I tell my students that we are going to read this book a second time, and record some of the descriptive sentences from the book. Noticing these descriptive words and sentences will help us to become writers who use exact words and vivid sentences. 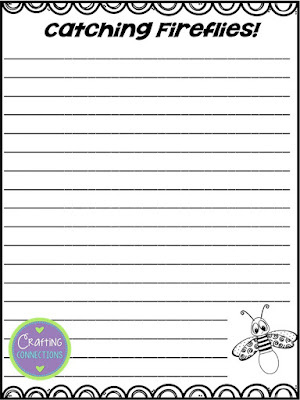 I distribute a recording sheet to each student (printed on one sheet of paper so that the recording sheet is 2-sided). We read through the top paragraph and direction paragraph, and then we read the top row of the chart: The author could have written a dull sentence.. but instead, she wrote this descriptive sentence! As you can see, the dull sentence is provided. 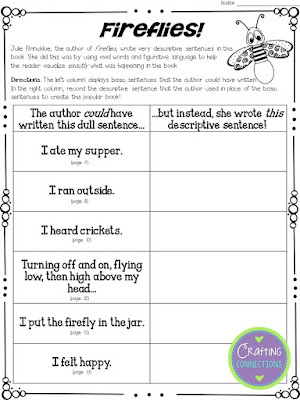 As you read the book a second time, students need to listen for a descriptive sentence that the author used in place of the dull sentence, and record it on the sheet. (I model the first few using my document camera.) Page numbers have been provided so students know when they should start listening for a replacement sentence. Thanks for stopping by! 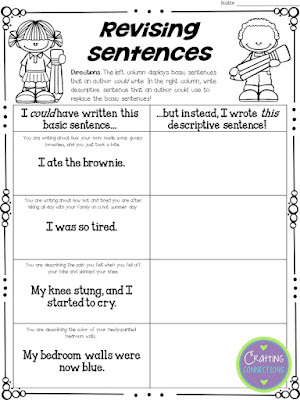 I hope that you'll be able to use this writing activity in your classroom. 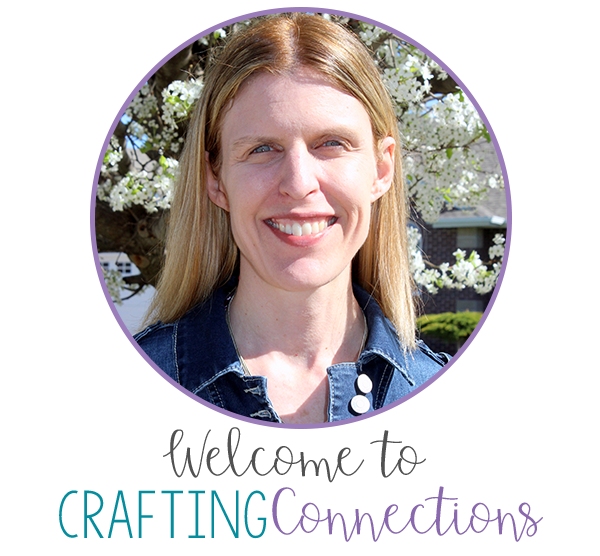 Have fun checking out the other blog posts~ that's where I'm heading now! What a fun book and great resource! Thanks so much for sharing! Thank you, Deb. This is one of my favorite books. I've never read this book before, but now I must! What a wonderful mentor text for teaching descriptive writing. Thanks, Deb! !